Become a member of our online gallery. Showcase your artwork alongside other talented artists, artisans and craftspeople working in a variety of media. Our online gallery provides an affordable way to get started online or to drive extra traffic to your website. 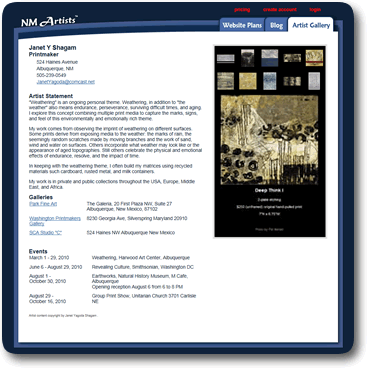 A page on the gallery includes a generous amount of room for text (Artist Statement, Bio, whatever you want), plus gallery and event listings, and your basic contact information. You can choose from either our 5 or our 10 image plan. Image thumbnails can be clicked on to bring up a larger image and descriptive details. Keep your page up to date through our online account management program free of charge. 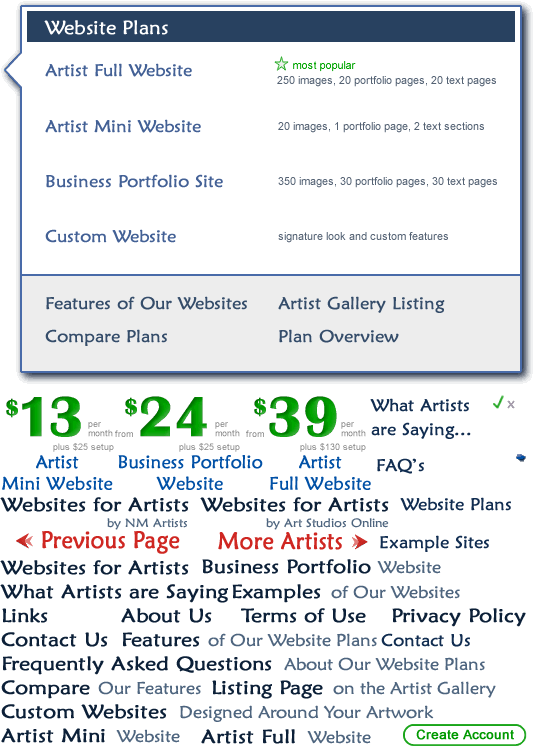 Mini, Full and Business Portfolio sites receive a listing on the Art Studios Online Gallery at no extra charge.